Learning about safety can be fun! Visit the sites below to learn more, or create educational opportunities in your classroom. The springtime severe weather season is quickly approaching and that means it’s time for the annual 2014 Nebraska Severe Weather Awareness Poster Contest. The contest, sponsored by Nebraska Association of Emergency Management, the National Weather Service and the Nebraska Emergency Management Agency, is part of the annual Severe Weather Awareness Week effort produced by Emergency Management Directors/Coordinators across Nebraska. The poster contest is open to all fourth-grade students in Nebraska public and private schools as well as home-schooled fourth-grade students. Teachers are encouraged to have students participate while teaching them about hazards of severe weather in Nebraska. While not specifically designed to promote tornado awareness, tornadoes are the most common theme chosen for posters. Lightning and flooding, which are also products of severe thunderstorms, are also good topic choices. The "First-place" winner in the state contest wins a $125 Gift Card. "Second-place" winner receives a $100 Gift Card and "Third-place" winner receives a $75 Gift Card. The Nebraska Association of Emergency Management provides the “First”, “Second” and “Third” place gift card awards. The “Fourth” place poster winner will receive a $50 Gift Card sponsored by the National Weather Service. Also all four winners will also receive a NOAA “All-Hazards Weather Alert Radio” from the Saline County Emergency Management Agency. 1. Poster artists must be a fourth-grade pupil in any Nebraska private, public or home school. 2. Entries must be related to the theme of severe weather safety and will be judged on originality, effort and accuracy. All entries must be on an 11" x 17" sheet of white paper providing a 1 inch border to allow for matting the winning posters. Any medium may be used (crayon, paint, markers, etc.). Only one entry is allowed per pupil and no joint entries (posters by more than one person) will be accepted. 3. Each school is encouraged to conduct the contest. All entries must be received by the local Emergency Management Director/Coordinator or Postmarked on or before Feb. 21, 2014. A list of EM Directors/Coordinators can be found here. 4. Each entry MUST INCLUDE student name, age, complete home address, home telephone number, name of school, location of school and school phone number on the back side of the entry. 5. Teachers are encouraged to contact the local emergency management director to assist in the selection of the “top three” entries from their school. If the local director is unavailable or unknown, please contact Mark Meints, Poster Contest Chairman, (402) 223-1305. 6. First, second, third and fourth place winners will be chosen. All winners will be notified by telephone or mail. 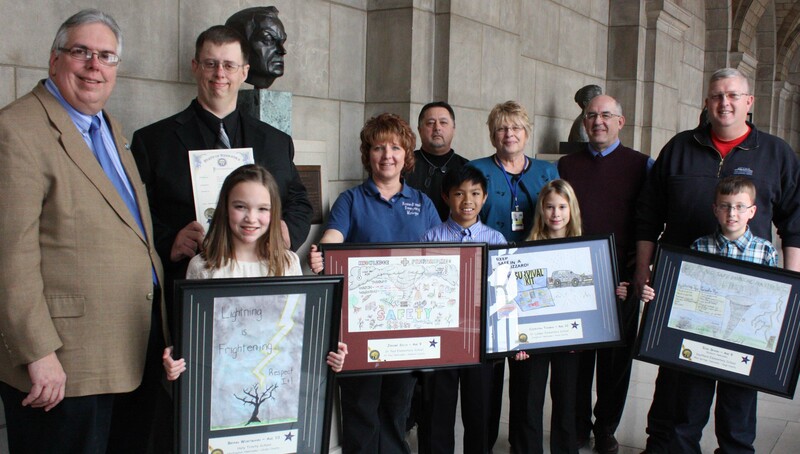 The four winners and their parents will be invited to the State Capitol on Thursday, March 13, 2014 @ 10:00 A.M. for the presentation of their awards from NAEM and NWS and be recognized by Nebraska Gov. Dave Heineman. Contest rules and other information can also be obtained at the Nebraska Association of Emergency Management Web site at www.naem.us. Poster Judging will be February 28th by the Nebraska Association of Emergency Management and representatives from the National Weather Service and the Nebraska Emergency Management Agency. FEMA's Ready for Kids provides fun online games and activities that build knowledge in a wide range of disaster preparedness topics. Play Disaster Master to learn great tips for personal preparedness and then go on a mission to Build a Kit with Gayle and her friends. Cell Phone Sally is helping people become more cell-phone savvy. Sponsored by the Texas Commission on State Emergency Communications, the character is part of an education campaign to inform people of the limitations of cellular phones when making a 9-1-1 call. Tox Town is a guide to commonly encountered toxic chemicals, environmental health risks, and the public's health brought to you by the U.S. National Library of Medicine.